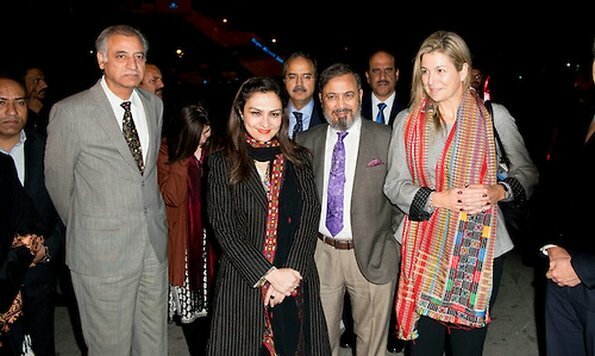 On February 08, 2016, Queen Maxima of the Netherlands for a 3 day visit to Pakistan visits at the invitation of Pakistan and as a special advocate of the Secretary-General of the United Nations for inclusive finance for development. Youpi,revoilà Maxima ! Elle me manquait. What is she wearing, smoking jacket? Queen Maxima looks younger and much better, she lost some weight. Elle n'est pas maquillée à cause probablement du long voyage de nuit qu'elle vient d'effectuer....Voila pourquoi elle semble plus jeune ! Wow, meeting her foreign welcoming committee when she's wearing no makeup and has messy hair. Surely after an 11-hour flight she had time at the end to freshen up before disembarking. Yikes, not good. Yes you are right , she didn't come for vacation to Pakistan.She should have look more made up.By how you represent yourself you show respect. What a down to Earth Queen! Travelling in comfortable clothing and without makeup! No wonder she always looks so beautiful! More care should have been taken with her appearance when arriving, the ladies in the arrival party to show respect,took the time to be beautifully made up and the men in suits and yet the Queen no makeup and in what looks more nightwear than day wear. A few years ago when the then Queen Beatrix and Crown Prince Couple arrived late to their destination and both ladies arrived late and without makeup little comment was made because the then Queen Beatrix was also without makeup - double standards perhaps? Why is it that we accept certain behaviour from those born into a Royal family and not from those who marry into one?